I apologize for the inactivity on this blog in the last few months. However, I was motivated to break this cyber-silence by wanting to share some news about the marvelous Ozark Medieval Fortress project. For those unfamiliar with the OMF, think of being transported back in time and watching a medieval castle being built. You would see the quarrying of stone, stone masons shaping the stones, a blacksmith repairing the chisels used to cut the stones, a horse transporting the stones around the building site, a rope maker, a basket maker, a tile maker, etc. That is what you will find in Lead Hill, Arkansas, not too far from the popular tourist city of Branson, Missouri. Here is an architect's rendering of the site, (permission to use this image was to me granted by Noémi Brunet). The site does not use power tools. They use thirteenth century technology. And that is what makes it so incredible. The process is just as important as the finished product. The workers are not only engaged in construction, they are there to answer questions as well. The OMF closed for the winter in November, but they are reopening for 2011 this Sunday, March 27th. I wanted to alert my medievalist friends to the entertaining and informative blog by "Medieval James" a guide who works at the OMF. He has blogged about topics such as medieval games, the introduction of clocks, and how things were measured on medieval construction sites. You can even find a video on his blog showing how stones are split by repeated blows with hammers. 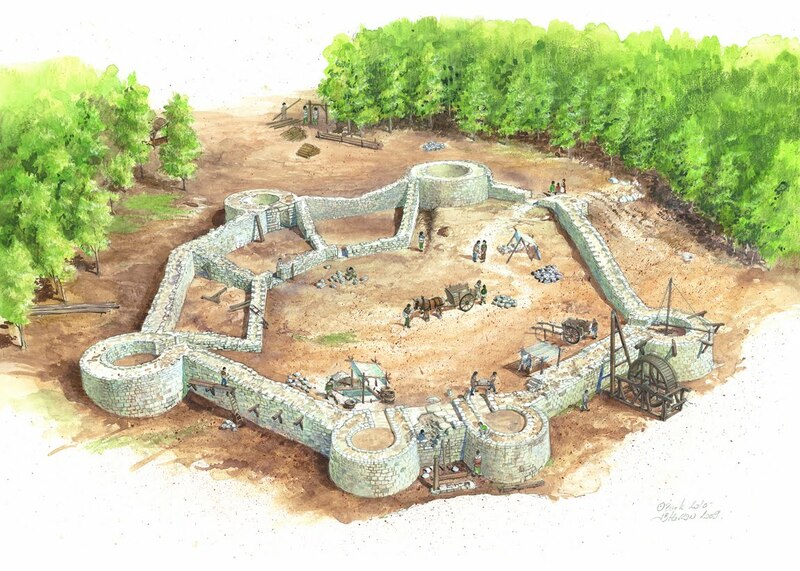 I was recently contacted by Canadian filmmaker Pierre Samuel Rioux who shared with me an excerpt from his forthcoming documentary The Beginning of Ozark Medieval Fortress...in America. The excerpt shows an interview with a Danish volunteer and you will see a few brief scenes of a stone tower being built. Should that link not work, here is another for the same clip. I hope you will share this with others to help spread the word about the Ozark Medieval Fortress. I visited the "original" project, Guèdelon, in France last summer. It's a wonderful travel in the past. I adore Guédelon as well and we will be visiting there again this summer. Here's a link to the blogpost I wrote about when we visited there in 2007. You might also recognize that Guédelon is the castle in the masthead of my blog.